I know that the August "me" and the May "me" are just two totally different people. Autumn was made for teachers. Ahh, yes. There is no time quite like fall and the beginning of the school year for assessing prime teacher performance. Fall is just our best time. We're at our peak. On our game. What I am about to share I feel I must preface with this: I LOVE my job. I adore it. I come home every night from work with stories to share and tales to tell. I brag to my mother about the students I teach. I tell both my students and my colleagues how much I enjoy my work. It is hands down the best job in the world. But still. Even armed with this knowledge about myself, I know that the August "me" and the May "me" are just two totally different people. Autumn was made for teachers. Like peanut butter to jelly, peas to carrots, ketchup to fries, so too is a crisp autumn day to a teacher. Ahh, yes. There is no time quite like fall and the beginning of the school year for assessing prime teacher performance. Fall is just our best time. We're at our peak. On our game. 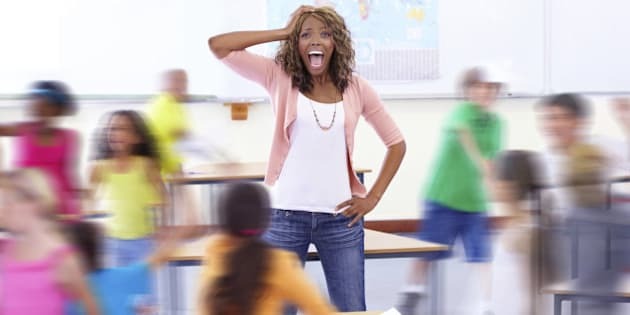 In August and September, teachers not only have stores like Staples on speed dial, we are their most frequent and beloved buyers, as well as their most valued, premium card-holders (shout out to these stores for their Teacher Appreciation Reward sales. Where would we be without them). Mmmm-hmm. There is nothing quite like the Teacher's Appreciation Day, the "prior-to-school-starting" sale, along with the 10-cent Hilroy scribbler deals found at a certain block store (Walmart) to raise adrenaline and emotions, even while irking the odd slacker who missed the random Thursday special due to post-traumatic summer disorder. Truth. I have been known to plead for the discount, showing expired cards crammed somewhere inside my wallet so as to not miss out on the $14.26 I might save from my hundreds of dollars expense. I have used my husband as collateral/verification. I might even have shed a tear. It's just how it is. Because... beautiful August, that's why! Month of glory. Month of high regard. We teachers, like revered saints from a respected religious order, appear fresh and sparkling. Presenting ourselves like white-washed walls found in a pristine chapel. We are shining and brilliant in all our wonder. And nowhere else will anyone find such organized cupboards, such tidy shelves, such neatly stacked books than in a teacher's classroom mid-August. No where else on earth will the smell of Lysol be so predominant. If so much as a staple or tack is out of line, the whole bulletin board is torn down. If so much as a beetle darkens the farthest corner, its brief life snuffed out. Not a chair nor a piece of chalk nor a pencil out of place. Every shred of lined paper accounted for. Every name tag written in calligraphy. Such is the state of a classroom in August. As for the teachers themselves, they are the picture of professionalism. There are new outfits already lying on chairs and dressers in every female teacher's bedroom at least two weeks prior the big day. (Men, on the other hand, may still only be thinking of how long they can get away with their khaki shorts and flip-flops.) Everyone has either socks or nylons bought to last into November when the onslaught of Christmas shopping will again begin. Underwear for every day of the week with the tags ripped off has been purchased. Haircuts, eye appointments, dentist appointments checked off the list. Yes, truly August is our best month. There is no time better for being a teacher. But now it's May. And May rhymes with cray-zay. Because that's kind of what it is. No longer do we care about Staples. Or Walmart's scribblers, or any store's school-supply offerings, for that matter. We use the flyers to collect the peelings from our vegetables. If we so much as SEE a Hilroy scribbler lying around, it gets biffed into the recycle bin. Pencils on the floor? Garbaged. Bulletin board posters falling down? Does anyone really even look at them anymore? Don't even try to look under our desk. Truth number two: I myself have been known to avert my dark, raccoon-like eyes from safety hazards such as piles of paper on my guided reading table, only because I know THERE ARE ONLY A FEW MORE WEEKS LEFT. The great summer purge is coming. I have left pumpkins on my counter from the fall until they became bonafide science experiments. Mildew growing in the lunch bin? Let's learn about it. Scissors that will no longer open and close because they have been permanently glued shut? Try washing them off in the fountain and if that doesn't work, chuck 'em. Hand sanitizer bottle empty? Haven't we all already had the flu? Twice? And folks, any nice day that the temperature goes up above freezing, we will be considering it for an outdoor read-aloud. Splash pants and a parka may be required. We do live in Canada. Yes, May. Cray-zay. A month where I have already exhausted my outfit options to the point that I am now wearing my 11-year-old daughter's accessories. I don't even look in the closet anymore -- I just grab and go. And please don't examine my footwear. I no longer own any shoes that don't have scuff marks, gumwads or glue chunks stuck to the bottom of them. Neatly coiffed hair? Well, does a bun count, wound around a pencil? But let me tell you this. When August rolls around again in another three months, mark my timely words: you won't even recognize us, we'll be so on fire, so back on the ball again, so back on our game. We'll look every bit the professional we know we are. Our classrooms bright and shining like there's no tomorrow. It's still in there, buried under exhaustion and burn-out, that need to surf Pinterest for the next best thing. That burning desire to decorate and laminate. It's there somewhere. And come August, we'll bring it all back again. Mark my (grammatically correct and sometimes phonetically spelled) words.